Campaign for the American Reader: Pg. 99: Trenton Merricks's "Propositions"
Featured at the Page 99 Test: Propositions by Trenton Merricks. Propositions has two main goals. The first is to show that there are propositions. The second is to defend an account of their nature. While pursuing these goals, Trenton Merricks draws a variety of controversial conclusions about related issues, including, among others, supervaluationism, the nature of possible worlds, truths about non-existent entities, and whether and how logical consequence depends on modal facts. An argument is modally valid just in case, necessarily, if its premises are true, then its conclusion is true. Propositions begins with the assumption that some arguments are modally valid. Merricks then argues that the premises and conclusions of modally valid arguments are not sentences. Instead, he argues, they are propositions. So, because there are modally valid arguments, there are propositions. Merricks defends the claim that propositions are not structured and are not sets of possible worlds. He thereby presents arguments against the two leading accounts of the nature of propositions. Those arguments are intended not only to oppose those accounts, but also to deliver conclusions about what a satisfactory account of the nature of propositions should say. Of particular importance in this regard are arguments concerning the alleged explanations of how a set of possible worlds or a structured proposition would manage to represent thing as being a certain way. Merricks then defends his own account of the nature of propositions, which says only that each proposition is a necessary existent that essentially represents things as being a certain way. 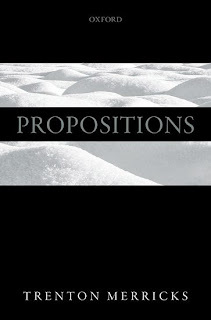 Learn more about Propositions at the Oxford University Press website. The Page 99 Test: Propositions.